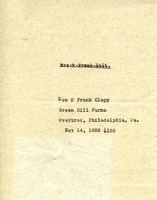 Contribution record for Mrs. B. Frank Clapp, Philadelphia, PA.
Letter to Martha Berry from James Stark, Jr.
Stark, Sales Manager for the Pennsylvania Coal and Coke Corporation, encloses a contribution. 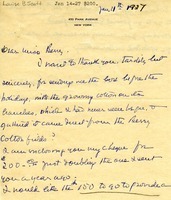 Louise B. Scott writes in thanks for the Christmas cotton, enclosing a contribution of $200, twice as much as her previous year's gift. 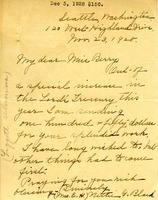 Henry J. Sloane writes to contribute a scholarship and additional funds for "little necessities" for a student. 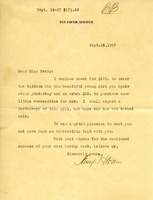 He wishes to receive a photograph of the student his contribution sponsors and hopes she does not have bobbed hair. 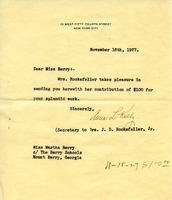 Ormsbee sends her annual contribution. 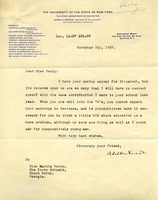 Adelbert Moot is writing to Miss Berry to make a contribution. 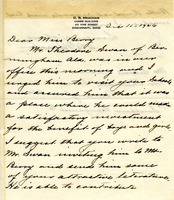 She also mentions she has the moving appeal for Elizabeth. 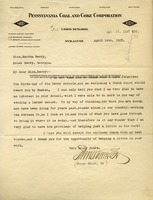 Urges Martha Berry to write Theodore Swan of Birmingham to visit the schools because he is interested and able to contribute to make an investment to benefit boys and girls. Miss H.W. 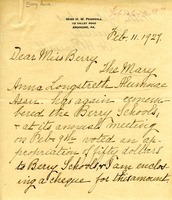 Pearsall writes to enclose a contribution from the Anna Longstreth Alumnae Association. 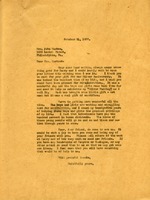 Malcolm F. Jones writes that he has enclosed $5 for his "1927 contribution to your great work." 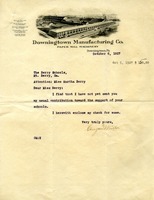 He wishes Martha Berry success in the coming year.